“What did we do?,” she said. “6.2”, I replied. I’ve been quiet since my Santa Hustle on Nov 23rd. But I haven’t stopped running. My daughter, Lucy, got home from college and she’s training for a 1/2 marathon in Minnesota – in February – called the Hypothermic Half. (And I thought I was crazy…) So, she was all about getting some mileage in and I was happy to NOT become a lump on the couch, though I was tempted. We managed some nice 4, 5, 6 mile distances. THEN, we got an invitation from Ms. Joanie Benoit Samuelson (friend and former neighbor) to go for a spin with her and her daughter, right before Christmas. Well, let me tell you, this was an EVENT. I’ve gone running with Joanie once, more than a year ago, and was both humbled and inspired. And I was really slow but kept with group, mostly, because they slowed down for me. Now, I’ve got 2 marathons behind me since then, plus the extra 1/2 marathon, plus the recent running company of my young, spirited, daughter. I felt energized and excited. We met up in the morning, in a mix of snow/rain/freezing rain (yay, Maine). Some warm greetings exchanged, then we were off, 2 and 2, around Joanie’s favorite roads and trails. It was amazing. I was running better than the last time, and the girls were paced well together. I asked a lot of questions knowing that Joanie could talk and run with no problem. Lucy, in particular, had wings on her feet and was having a blast – after about 45 minutes, she looked over her shoulder to give me a “thumbs up” but saw me dropping off the pace, definitely way at the back. Just after that, Joanie (in the lead, natch) yelled back, “Do you want to loop again or finish up?” Fortunately for me, Lucy took mercy on me and chirped, “One loop is fine, thanks!” and I smiled at her for saving me. But, on the upside, as we trotted into her driveway, she nodded and said, “You’re much faster than the last time we ran together.” Best Christmas Present EVER. Really. I keep hearing her over and over in my head. So, Lucy and I departed, grateful for Joanie and Abby to share their run with us. It was such a great day, and we felt so good about it, that we set out for a solid 10 miler right after Christmas. We took off together, but about 7 miles in, it was just so obvious that Lucy was holding back to stay with me. I told her to follow her feet and find her own pace. She smoked me. And as I arrived, there she was waiting, walking in circles, all cooled off. But, we both got the 10 done and were pretty happy about it. Then, Janet was ready to run. Last Sat, we took off in single digit temperatures. We hadn’t seen each other in a while, so we had a lot to talk about, and we realized we were hauling. Really. We both had a serious undercurrent of energy that fed off the other person and we just moved. Fastest I’ve ever run 6 miles *and* we had negative splits with hills. All of this has been so inspiring that I decided to buy some new kicks. I really do need them – the soles of my sneaks are showing wear with about 450 miles into them – so definitely time to go shopping. 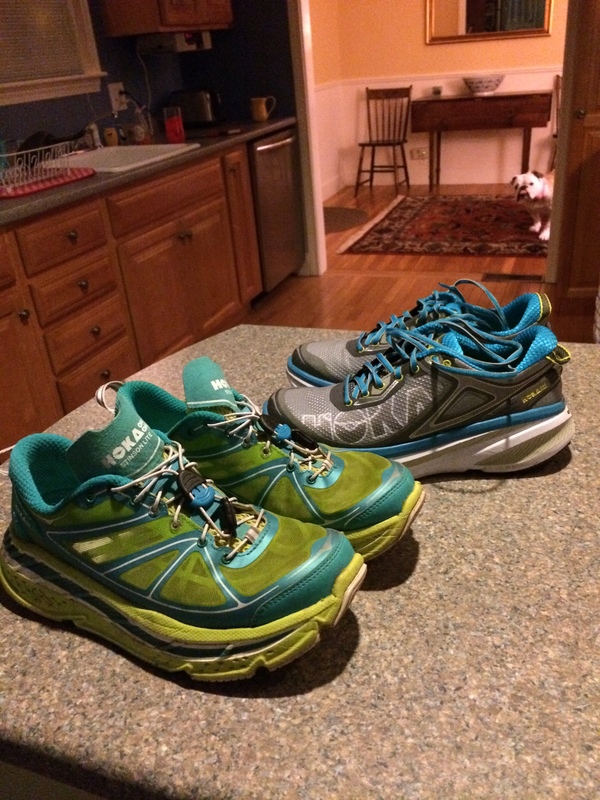 And… as you know… I’m a fan of Fleet Feet Maine Running Company (the store) and a huge fan of the Hoka (the shoes.) One might even say I’m a bit evangelistic about the Hokas. I’ve been through several pairs of the Hoka Stinsons since training for the Philly marathon in ’13, but I got brave, and ordered the new, Hoka Bondi 4. They have some cool features and I was anxious to try them. Today, I got in a good 6 miles (in 0 degrees, thankyouverymuch), and I liked the shoes. But a major blister was revealed when I took them off. Too soon to say whether they’re going to work, but it’s not looking good. Blisters are bad. I may have to go back to another pair of the trusty Stinsons. We’ll see. Old Port Half Marathon – Not Conquered. Completed. Ann Marie on Mileage catch in Chicago. Ann Marie on Run. Walk. Talk. Repeat. Ann Marie on Plant What? I'm squarely middle aged, mom of two grown daughters, with a full time job. My lifelong activity had been horseback riding, but with the calendar complexities of my job and family, running became a way to stay fit, no matter the schedule, and it's FREE!